In my last post I included links to some individual Etsy sellers that I thought sold beautiful versions of the hamsa necklace. Many of you clicked on those links and due to the traffic spike one of the sellers contacted me and asked if I wanted to hold a giveaway - the only answer to that of course is abso-friggin-lutely! I love this piece that Elisabeth makes and sells. Sideways, delicate and incorporating a tiny evil eye, it's a pretty piece and one that I personally am going to order for myself. And FYI, not to sound like a Modern Family obsessive or anything (I love you Cam!) but apparently it is also worn by "Claire"aka Julie Bowen on the show. So here's the deal. I don't like to make giveaways complicated. If you would like to be in with a chance of winning just enter a comment with the words "Enter me" - a phrase that always makes me giggle in an extremely immature/double entendre kind of way. FYI - The store on Etsy is called maldemer and can be found here - Link! <3 your blog btw, i never comment enough! I love your blog, wish i could travel between two awesome places like you do. P.S. When you mentioned laughing at the 'enter me', I burst out laughing. hahahah! Gorgeous necklace and it's meant to bring good luck! 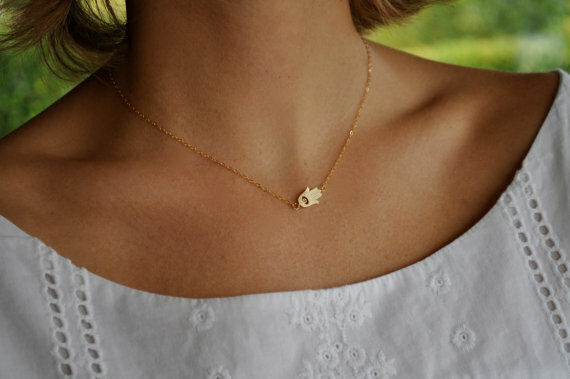 Such a lovely, dainty necklace :) Enter me! oh i love this. enter me please! ooh i've been looking for the perfect hamsa necklace. enter me please! Enter Me :) Please and Thank you! Enter me please. Love Hamsa hand accessories. Enter me ;) Love the necklace, so dainty and beautiful. One day I will eventually win a give away! Well that is beautiful! might have to buy it anyway! Enter me, my body is ready! enter me!! Love your blog so much! I hope you get great pleasure out of reading hundreds of women saying this. I AM A "MODERN FAMILY " enthusiast as well. i found the chance to tell you that i misss your videos sooo much!!! anyway ...enter me! Enter me please. I was racking my brains trying to think of something to write to make you giggle when actually you were talking about the phrase 'enter me' which whilst writing this has only just made me realise why It's so funny! I'm never going to read it the same way! Haha. Anything that's modern family related is a winner in my eyes! Enter me, please. Thank you for the giveaway- it's such a lovely necklace!